After a bunch of calls where all you heard was ‘no’ or you’ve just left voicemail after voicemail, this is a pleasant departure, right? Someone that is actually interested! Because there were so many of them, it caught my attention. To see if my reaction was right, I went back through and searched for the subsequent calls to those targets and sure enough, not a single one of them had resulted in a conversation, let alone an appointment. If they are interested, it reduces the crap shoot of trying to get lucky and call when they really aren’t busy. As I like to say, nothing works all of the time, so even if we put the call on the calendar, sometimes it is still a brush off and they just won’t answer the phone at the appointed time. But, I’m all about increasing my chances for success wherever I can, so if they agree to take my call, most of the time they will, so it’s worth doing. Particularly if you are calling on executives. Very few of them say that unless they mean it. It happens more with unsophisticated buyers, owners of small businesses who haven’t developed the guts to just say no. Caponi Performance Group and Contact Science jointly market the telephone prospecting and cold calling solution called Coldcalling101™. It is the only comprehensive solution to solving the biggest barrier to success in most selling organizations—the inability to secure enough Initial Appointments to begin the selling process. We accomplish that through simultaneously addressing both the efficiency and effectiveness of the process. We can be reached at 817 224-9900, www.caponipg.com, or at bcaponi@caponipg.com. 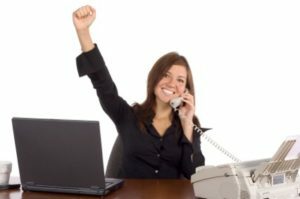 You can also find answers to many of your challenges in our books: Contrary to Popular Belief, Cold Calling DOES Work! Volume I: Effectiveness, The Art of Appointment Making and Volume II: Efficiency, the Science of Appointment Making. Previous Previous post: Should I ask for voicemail or should I leave my message with the receptionist?